Brian Graham has been surprised to see his former club struggling to find a win. But while he has sympathy for them and admits he still has a soft spot for Raith Rovers, he does not want to see them get back on track against Hibs this afternoon. While the Easter Road side have been quietly and consistently going about the business of trying to wrap up a league title, the Kirkcaldy side, who are hoping that a change of manager can alter their fortunes, have not tasted victory since October and now sit just four points off the relegation play-off place. But everyone at Hibs will be wary, especially after John Hughes was appointed in place of Gary Locke. 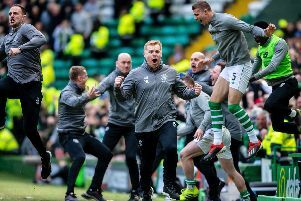 “Usually when a new manager goes in a team gets a big lift,” said Graham, who is keen to get in on the action on a more regular basis and convince his gaffer Neil Lennon that he can add goals to the attacking line. “We know it’s a difficult place to go. But we’ll go with high hopes of getting the three points. “It surprises me to see where they are because they have a good squad. You look round about them and they have got good players. You obviously don’t know what is going on in the background but it wasn’t to be and they have changed their manager now. I think John Hughes will bring something different to them and I believe he’ll have them right up for this game. “They’re a club I’ll always hold in high regard but I can’t have any sentiment for them. I played against them for the first time with Ross County at the beginning of the season in the Betfred Cup, and I scored a penalty that day. I got a few shouts from their end for doing that but it was all good. would be considered a healthy advantage. But Hibs’ fate lies in their own hands. One defeat in 17 matches in all competitions, they have suffered just two losses in the Championship all season. The last league match, against Ayr United, did end in a stalemate, though, with players and manager again left to rue the poor conversion rate for chances created. The derby cup tie was partially blamed but, with the replay looming on Wednesday, Graham says there will be no issues with concentration levels this afternoon.